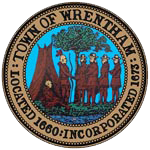 WRENTHAM — Town Administrator Kevin Sweet and King Philip Regional School District Superintendent Paul Zinni are pleased to share that the Wrentham Board of Health voted to restrict the sale of flavored tobacco products in town last week. The board unanimously approved the restriction on Thursday, March 21. Although the sale of flavored tobacco products will be restricted, menthol and mint flavors will still be permitted. The restriction takes effect August 1. Danielle Berry, a member of Healthy KP, spearheaded the effort to restrict flavored tobacco products, specifically with e-cigarettes and vape products in mind, after she read about a similar initiative in Foxborough. She contacted the Wrentham Board of Health to see what could be done, which spurred the board to consider a restriction. Healthy KP is a community coalition formed by the King Philip Regional School District that seeks to prevent the use of alcohol, drugs and tobacco among students. The coalition was launched this past fall. In a 2016 MetroWest health survey, which was completed by 24,385 anonymous high school students throughout the region, 25 percent of King Philip High School students acknowledged they had vaped or used e-cigarettes. The National Institute on Drug Abuse announced in December that approximately 37 percent of high school seniors reported vaping in 2018. WRENTHAM — A group of Northeastern University civil engineering seniors are studying the layout of Wrentham Center and developing a new design that will better serve pedestrians, bicyclists and motorists alike. The five seniors, Jessica O’Neil, James Ceal, Cameron Parker, Josephine Rosenthal, and Odera Cole, began studying Wrentham Center – near the intersection of Route 1A and Route 140 as well as the surrounding streets – when their capstone design class kicked off in January. The students are the first to use drones to survey their area of study as part of the design capstone class at Northeastern. With the images they collect with the drones, the students will be able to generate a map that will be used for the basis of their design. As they craft a new design for the area, the students are searching for ways to improve bike and pedestrian safety, and are also looking to connect the available green space near the downtown. The group is also examining how the roadways could be used most effectively and safely by motorists. Their design will embrace and promote a “complete streets” approach, where all users are considered equal, while considering the potential for future economic development. “The class is a culmination of students’ academic, real-world and cooperative experience,” said Northeastern University Professor Daniel Dulaski, who is overseeing the students’ project. The design capstone class encourages students to think of their favorite cities and the elements of those places they are fond of, and to try to integrate those into their design. Dulaski also asks students to think about all of the transportation users and commuters that may pass through an area as they develop their designs. The five students working on the Wrentham Center redesign have also created a survey for residents to share their input. Residents can take the survey by clicking here. Over the last decade, Northeastern students that have taken the capstone design class have worked on 45 projects in 22 communities. A prior group of Northeastern students provided a similar design proposal for the Town of Mansfield, and that design helped the town to secure a $2.37 million MASSWORKS grant. O’Neil and her project partners will complete their design this April. WRENTHAM — Town Administrator Kevin Sweet is pleased to announce that he has appointed Mary Beth Bernard as Wrentham’s first part-time Director of Human Resources. Bernard began her position as the town’s Director of Human Resources on Jan. 29. A Wrentham resident, for the past five years Bernard worked as the Assistant Town Manager/ Human Resources Director for the Town of Foxborough. Before her position in Foxborough, she served as the Director of Human Resources for the Town of Westwood for 12 years. Bernard has also worked as a Human Resources Consultant for several municipalities in Massachusetts. Since 2015, Bernard has also served as the Chairman of the Massachusetts Municipal Personnel Association, and she is also a Presidential Member of the Massachusetts Municipal Policy Committee on Labor Relations. Additionally, Bernard is a Certified Senior Professional in Human Resources, Certified Society of Human Resources Management Senior Professional, and a Certified Trainer for the Massachusetts Commission Against Dscrimination (MCAD). As the Director of Human Resources, Bernard will direct and supervise the personnel systems of the town, including classification, compensation, recruitment, selection, labor relations, and training. She will also act as the chief negotiator for collective bargaining.